When you come to college, it is normal to break up with your high school sweetheart. College is a much different place than high school. There are new people, new environments, new situations. It can be a time where people truly find out who they are and where they want to go with their lives. It’s also a time when people change and mature. Many times, these changes cause a rift in high school relationships. Let’s be honest, college is not only a place that people come to learn in the classroom. It’s also a place where people come to grow, find independence and meet new people. Coming into college while dating your high school sweetheart can really put a damper on these things. How can you go out with friends if your sweetie is going to be jealous that you’re doing that without them? How can you find your independence if you’re constantly dependent on your sweetie? How can you meet new people if your sweetie is worried that he or she is going to be replaced? A lot of the time, the answer to these questions is simply that you can’t. You can’t start a new life while holding onto your old sweetie. I know that it is hard to hear and even harder to accept. I mean, this is your high school sweetie we’re talking about; maybe even your first love. Just remember: Breaking up with them doesn’t mean your time together meant nothing or that you no longer care about them. 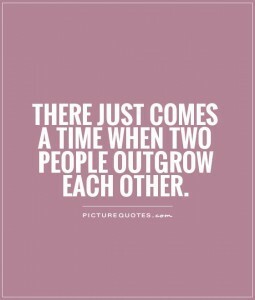 Breaking up simply gives both of you the chance to grow into the individuals you were meant to be. « What Can I Get Involved With?